This website is about how governments, businesses, civil society and donors can use public private dialogue (PPD) to promote private sector development, open governance and poverty reduction. For good practice material, tools and lessons learned stay here! To get PPD news, see PPD videos, interact with hundreds of other PPD fans and contribute to our community of practice, join the Facebook PPD Club. 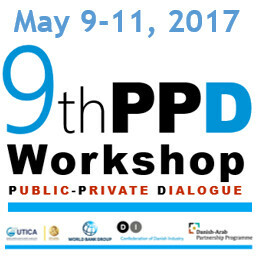 FEATURED: The 9th PPD Global Workshop: "Public-Private Dialogue on Enterprise Development for Youth & Inclusion" took stock of recent use of PPD for inclusive development, explore critical links between competiveness, youth, gender, and migration dimensions, and helped build capacity of participants to effectively manage and monitor a PPD process during the PPD life cycle. It was organized by the Confederation of Danish Industries, the World Bank Group and the Union Tunisienne de l'Industrie, du Commerce et de l'Artisanat (UTICA). Click here to get the proceedings and materials. NEW: Updated lessons learned page, featuring a PPD practical notes series devised as how-to guides that capture the evolution of PPD and the challenges faced by practitioners since the first PPD handbook was published in 2006. 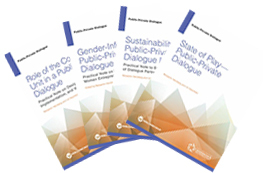 Go explore "PPD: State of Play", "Design, Implementation, and Management of the Coordination Unit in a PPD", "Gender-Informed PPD", and "Ensuring Sustainability of PPD Initiatives". Still available for free download: Public-Private Dialogue for Sector Competitiveness and Local Economic Development: Lessons form the Mediterranean Region, a comparative study which explores the influence of PPDs on local development and sector competitiveness. And our classic, the PPD Handbook, which includes basic operational guidelines for practitioners, a standardized PPD evaluation tool and the PPD Database tool to help manage and track the issues raised by working groups. PPD Online Course. 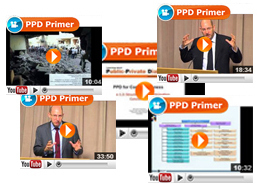 Always wanted an online a "PPD Primer" to learn about PPD or improve your knowledge on the topic? Find here a set of 26 video modules which can be used by PPD experts to build capacity among PPD stakeholders on secretariat effectiveness and PPD management, advocacy and communications, monitoring and evaluation and sector specific initiatives. Last updated: May 7, 2017. This website was originally created with support from DFID, the World Bank Group and the OECD Development Centre.